Nick Clegg has become the pantomime villain of British politics. A cipher for our discontent about politics, and the modern political class. But let’s step back and look for a moment at the New World Clegg has had a hand in shaping through his own eyes. He has lead his party into government. He has proved that coalition government can be stable. He has neutralised the more extreme instincts of his coalition partners. He has helped guide his country to a place of relative social and economic safety. Dan Hodges’ article also includes two persistent ‘myths’ — the inverted commas are deliberate, by the way: as you’ll shortly see it’s impossible to know whether they’re totally erroneous or just unknowable hypotheticals. Perhaps. But the maths are also tricky. 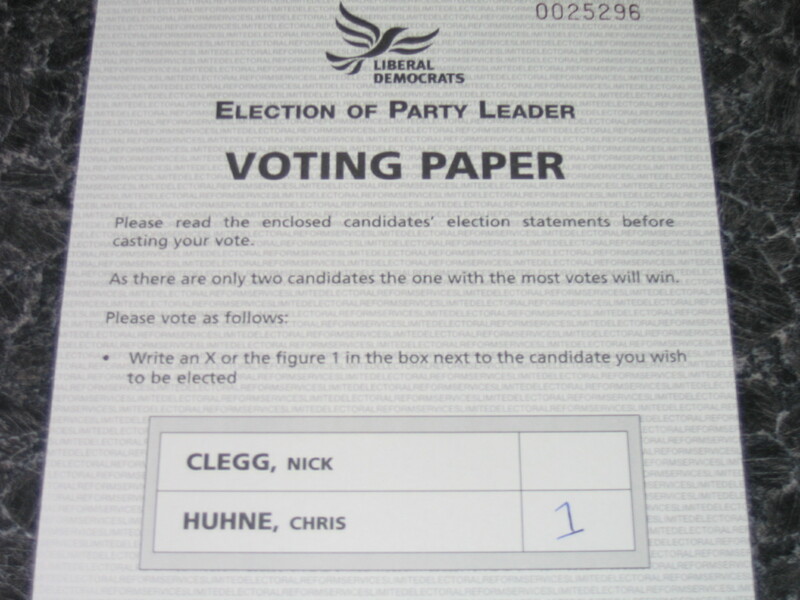 To have overturned Clegg’s 511 vote majority, Chris Huhne would have needed to pick up 871 (67%) of those final 1,300 votes and Clegg just 359 (33%). Not impossible, no — it’s why the ‘myth’ remains in inverted commas — but extremely unlikely. Even less likely is that an unofficial count would have been able to predict so confidently and with such exactness what these never-counted ballots actually said. 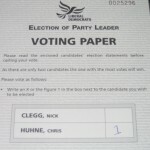 For the record, by the way, I voted for Chris — that’s my ballot paper in the photo — even did a bit of phone canvassing for him. But I don’t believe he would have won if those late votes had been counted. ‘Myth’ 2: If Chris Huhne had been elected Lib Dem leader, and become Deputy Prime Minister in May 2010, then his later arrest and conviction would’ve sunk the Lib Dems. There’s a lot of hypothetical here, so I’ll be brief with my own. Chris Huhne’s an ambitious man. Had he become Lib Dem leader, even more had he become Deputy Prime Minister, I very much doubt he’d have put all that in jeopardy by leaving his wife. And had he not done so, his historic speeding points lie would almost certainly have remained just that: historic.